Awesome thank you for that link YOWBARB. Kinda cool the simple little remedies they have out there these days! These I probably posted but here are a few things I have read and tried and used to help others too. Next post will be a novelette, I hope it fits in one post. I always drink a cup of hot tea at the first sign of a sore throat, that way I don't come down with a cold. When I tell other people that, they always ask things like regular or decaf, sugar or honey, etc. It doesn't matter. I use regular with sugar. It works. I also take a teaspoon of honey a day to ward off infections like the flu. I don't take this every single day, I just listen to my body about when to start and stop it. Thinking of the times to come... Please excuse all the edits. Can't get the spell checker to pop up now. These I probably posted but here are a few things I have read and tried and used to help others too. I hope All Ya All won't mind it is way too autobiographical. I do that sometimes. If I am too wordy, skim on down to the next item… My goal is to share info to help. Many of you Guests and Members have heard of and perhaps tried these herbs or methods. Louisiana Hot Sauce - cayenne not regular chili. Crystal brand from New Orleans is the best I have found. This can be used regularly, for those who like it. It has a warming, decongestant, healing quality.) I take it by the teaspoonful. Cayenne can also be taken in capsule form. I have used it for years, on and off at the first sign of allergies or colds, or asthma. It gets rid of the little allergic bumps starting up in the throat. The kind people have to take Benedryl for. Other uses: I had read in Curing with Cayenne that it can stop a hemorrhage. (You use it and still get the person to the E.R. (if there is one.) More on that later. Anyway a couple times late at night I noticed a little blood coming up from my throat. I took the Louisiana Hot Sauce letting it slide down my throat, coating it. I did this three times, lay there quietly, and willed it (whatever it was) to heal up. It apparently did. I was at my Mom and Dad's in the middle of the night and they were elderly. I was supposed to be helping them...didn't want them to have to drive me to the ER. Re cayenne I know this genius - he told me, after the fact he had (had) brain cancer. He had recently cured himself. Got a clean bill of health. Here's what I read about cayenne. It kills upon contact: bacteria, candida yeast, small parasites such as pinworms, viruses and tumors. If I have plenty around I dump it on all my food and drink it too. I have given it to one of my grandsons who suddenly in the early morning had such a bad congestion he was fighting for his breath. He was standing at his sink, coughing and all blocked off. I got him to take a small spoonful of Louisiana Hot Sauce followed by a few sips of juice. After a after a couple doses and some communication, he was breathing OK. I told his mother and stayed home from work and took him to the pediatrician. About a week before that, Grandson had walked into a cold, dirty swimming pool, soon after they moved into their house. Although he was not a toddler, it was early in the morning and he was just being a bit clumsy. Completely soaked cold and wet. It turned out he had caught strep and was put on antibiotics. Meanwhile I am glad I was there to help him when he couldn't breathe, no one else was waking up to help him. Late one night we went to see my (adult) son who was alone in his house out in the country and could barely breathe. He sat up looking panicked. That is one sign the person is having their breathing blocked they aren't laying down they are sitting up panicked! I had no Louisiana Hot Sauce so I saw he had some taco sauce packets in his ‘fridge. I opened them and made him quickly drink three of them, followed by some sips of coca cola. He was able to breathe, then. He had some kind of flu so one of my daughters and I went to see him a couple times to make sure he was OK. I gave him a little more hot sauce some garlic capsules, some regular canned chicken soup... he got through it OK. His girlfriend was gone up to see her family at that time and he was alone. It’s not really good to be alone with flu, etc. Yerba Santa Holy Herb was/and is the only medicine available to many people in Mexico. The uses are for colds, allergies, bronchitis, asthma emphysema and tuberculosis. I strongly recommend people have a big stash of it, and find a way to keep it dry and useable, in their storage area of their survival land. I don't know anything about dosing babies or kids with it, so that would take a little reading. It is very strong and tastes like a medicine. It can be made slightly less strong and honey put into it. I get it from a brother who lives in Tuscon. It gets imported from MX. It used to be possible to walk into any health food store and get all the See-Lect Teas from A to Z. I could get the Yerba Santa back in the 1970s. After that. I only got it from my bro. It could probably be found in most herb stores nowadays. Note: My breathing thing under control now… will be trying to use only natural means; not there yet. Back in the 1970s or so when Jack Lalanne was on the TV I watched him quickly demonstrate an exercise which opens up the breathing. Remember the old "you - must - develop - your - bust" exercise? The one where you pull back your elbows forcefully, with hands pointed toward one another? (Well it doesn’t develop the bust, but it will loosen congestion and un-stop some pretty badly stopped up breathing. I have used it on myself a couple times but the time I remember most was when my mother suddenly was struggling to breathe. One of my daughters and I were in her little home, resting on the couches, on a holiday visit. Middle of the night. Mom was 90 and had not ever had breathing problems that I knew of. She was panicked and wheezing. One daughter did the Heimlich on her but it wasnt really helping. I suggested to Mom what to do and quickly demonstrated the Jack Lalanne exercise. Jack had said, “after the 25th repetition your breathing will loosen up,” and that is true. That exercise did work on my mother too. Mom was able to breathe. We gave her water and she was then able to sit and read awhile and drift off to sleep. I have found that really works. Note: If the person is actually choking on an object use the Heimlich maneuver, but we are talking about sticky congestion so bad it makes people choke. Heimlich can help that but I found that the Jack LaLanne exercise worked better in that case. When she was able to talk again, Mom said it was that exercise that helped her to breathe again. I thought about that night and what could have brought that on. Her little place was next to my brothers big cabin type house. In the front was a long wooden porch- walkway where people were ducking out to smoke. Most everyone has quit since then, but I recalled there were five of the younger generation out there on that porch smoking, not twenty feet from my Mom’s door. It made me sad and angry to realize later, that was probably what brought on the breathing problem with my mother. People need to realize that even if a person does (not) have asthma the second - hand cigarette smoke can kill them. Sorry if this sounds preachy… I get sick when people try to duck out and smoke it does end up in the house anyway and on people’s clothes. People don’t get it and keep exposing me to it. I am grateful I was able to help my mother. She did live a few months longer without having to go to a nursing home, and she had all her marbles; she was 90 so that is not so bad. We wish we could have her with us much longer. Sorry this is so long… I just don’t know how to write this with less words… I am so grateful I knew that Jack LaLanne exercise for breathing. Aloe Vera plant - I once had a delay on some dental help. (I needed three wisdom teeth out when I was 36. It felt like my jaw was splitting apart.) Even with a strong pain reliever I was in agony. I had been keeping the aloe plant around for kitchen burns and my teen daughter's pimples. I had read that the aloe is a strong pain reliever, applied to the outside of the body, like a broken bone, so I tried that. So, I put aloe vera (peeled off the spines) on my aching jaw and it took the pain right out of it. I would have to change the pieces often... it gave me some much - needed relief. This kept me OK until I was able to get the three wisdom teeth extracted, a couple weeks wait. My kids usually did (not) get hurt or injured but one day some kid threw a brick at my daughter Jessica's face when she was on her way home from school. I didn't see who did this, my older daughter ran and told me. She must have walked them home that day. We had some aloe vera plant in the house. Jessica lay down on the couch and first we gently washed off the bruised scraped areas with cool water. Then my oldest daughter took peeled pieces of fresh aloe vera plant and placed them over each scrape, then put a bandaid on it, and asked her to just lie there quietly. I was in the middle of twenty different things... then checked on her a short while later while my older girl was still with her. After a couple of hours, the scrapes and bruises were nearly gone. Aloe Vera for pimples: My oldest daughter has pretty good skin but she went through a couple years where a little pimple would pop up. I told her to try the fresh aloe she did and they would just dry up and not spread. (I realize that is partly good genes that might not forestall a full blown acne face in some teens.) It worked for my daughter, for sure. Found about anti - aging effects: When I was drinking it regularly to help me relax a bit... I did notice the skin on my face looked younger. It is normally associated with German naturopathy, but I finally read that the ancient Egyptians used Chamomile for an anti - aging herb. I took the loose herb and placed it in a little stainless steel tea ball, to make a potful. Valerian herb was name after Emperor Valerian. Can’t remember now but I think a sleeping, nervous system herb was named after him. It is an ancient herb. I have tried it and it is very calming and seems good for mental health and sleep. I have given it to a couple people and it seems to help. According to Eat Right For Your type Book on foods herbs Valerian is highly beneficial for Type O’s. If you are not a type O blood, look it up in a herb book. Or try it. I recommend it as a substitute for relaxing pharmaceuticals and sleeping pills. As far as sleep herb combinations not posting it at this time, I just know the Valerian seems very healing to the brain and nerves…. "It's great isn't it? almost like certain plants were put here to be the pharmacy for us." I believe this. I think every plant is here for us, animals, other plants or all three. Check back often for new remedies!! Another unique and unusual treatment for bladder infections is to take a teaspoon of pure garlic juice. This is said to be effective in killing off the bacteria responsible for many bladder infections. This simple treatment can be repeated as often as needed. Use equal parts of apple cider vinegar and water. Dab on the affected skin areas allowing to dry. Apply as often as needed for relief. Apply apple cider vinegar, just as it comes from the bottle, to the skin area where the shingles are located, four times during the day and three times during the night if you are awake. The itching and burning sensation in the skin will leave usually within a few minutes after the vinegar is applied. Many old-timers swear by this treatment declaring that the shingles heal much more readily from the regular use of apple cider vinegar. An old time remedy for muscle cramps is two teaspoons of honey with meals. If this is done on a regular basis, the cramping will usually diminish within one to two weeks. It is recommended that the honey be taken on a regular basis to prevent the muscle cramps returning once you get them to stop. This has proven to be effective in cases of cramps in the feet and legs during the night. Make your own canker sore treatment by mixing one teaspoon of baking soda in a half cup of warm water. Use this mixture as a mouth rinse several times a day, especially after meals and before bedtime. This should give you some relief within 24 hours and they will usually clear up totally in about 3 days. A unique suggestions for a headache is using an ice-cold piece of cooking foil on your forehead. This is said to be perfect for curing a headache. One doctor who has been studying headaches for years says the foil cools the blood and the headache disappears in about two minutes. In case of indigestion, prepare a mixture of one teaspoon of baking soda to a glass of water and drink for immediate relief. It is normal for this to cause a burping or a belching reaction as the relief takes place. This is also recommended for heartburn. You can use this remedy a couple of times a day if necessary for temporary relief. If the problem persists, of if there are any other symptoms, be sure to consult your doctor. This old folk remedy is still being used in some foreign countries. Apply apple cider vinegar, just as it comes from the bottle to the varicose veins night and morning, by means of the cupped-hands treatment. Shrinking of the veins should be noticed by the end of the month. In addition to applying the vinegar to the veins, two teaspoonfuls of apple cider vinegar added to a glass of water are also recommended twice a day. One teaspoon of olive oil and one teaspoon of garlic juice mixed in a glass of warm water should help eliminate the bacteria responsible for bladder infections. Drink three times a day, before meals. Substitute cranberry juice for the water if the infection is especially stubborn. "The soul is healed by being with children." I remembered one my Mom told me for menstral cramps...drink a glass of orange juice at the first sign. It works! The key is that 1) you're getting needed fluids and 2) you're getting Vitamin C. I'm sure if you use other juices it could work too, but I stick with OJ. I would sick with OJ also....lots more vitamins Thanks you guys. LAUGHSALOTZ thanks for all these great ideas, including the orange juice. I don't find this previously posted, so some may find benefit of it...I would think, everyone would like to have some of this on hand and want to take it daily to build their immune system. The reason the Master Tonic is so powerful is because all of the ingredients are fresh, and are designed to stimulate blood circulation to help introduce the detoxifying ingredients into your bloodstream. Garlic is a broad-spectrum antibiotic that destroys gram-positive and gram-negative bacteria. While manmade antibiotics kill the good bacteria your body needs, garlic only kills the bad bacteria – it even increases your healthy bacteria. Garlic is also a powerful anti-viral (to target colds, the flu and upper respiratory infections) and anti-fungal. Onions have potent diuretic, antibiotic and anti-inflammatory properties. Studies have shown onions to be an effective expectorant, making them useful for infections like the common cold, flu and persistent coughs. Onions are also rich in quercetin, which has been shown to help prevent heart disease by stopping cholesterol from attaching to arterial walls and blood platelets from sticking together and forming clots. Horseradish is naturally antibacterial and anti-parasitic, and it stimulates your immune system. It has warming properties and acts as an expectorant, so it’s a potent herb for your sinuses and lungs. It helps open up your sinus passages and increases circulation there, which is where the common cold and influenza commonly begins. Ginger is also naturally antimicrobial and boosts your immune system. It can help with chills, colds and fever. Most Moms', remember from pregnancy, that it’s great for upset tummies, too. Hot Peppers can also help boost your immune system, act as a natural decongestant and have warming properties, which makes them a natural pain-reliever. Organic, raw, unfiltered apple cider vinegar has so many amazing properties to it. It’s a natural antiseptic and antifungal, great for digestion, detoxifying and so much more. Prepare all of your ingredients (chop, grate, etc.). Fill a glass jar about ¾ full with equal parts of the chopped and grated ingredients. You can use big gallon glass jars or smaller quart-sized mason jars like I used. Fill your jar(s) to the top with your raw apple cider vinegar. Make sure the ingredients are completely covered by the apple cider vinegar. Close the jar(s) and shake vigorously to mix everything together. Place a colander over a bowl and line the colander with cheesecloth. Place the mixture in the colander and use a plate to press the liquid out of the mixture into the bowl. You can wrap the cheesecloth around the remaining mixture to squeeze the rest of the moisture out of it. Pour the liquid through a funnel into amber bottles (I used 8 oz bottles, but you can use any size you like). I put a secondary filter in the funnel to make sure I didn’t miss any chunks. I ended up with enough master tonic for 18, 8-oz bottles! First, I’m going to warn you – The Master Tonic isn’t for the faint of heart. It’s spicy and it’s potent. You’ll probably feel a sense of shock when it hits your mouth, but the health benefits are worth it. For daily immune boosting, drink 1-2 ounces, two or more times each day. Just put it in your mouth, swish around, gargle and swallow. Don’t dilute it with water or the effect won’t be as powerful. If you’re fighting an infection, take the tonic 5-6 times per day. It can be used during pregnancy and it’s safe for children (use smaller doses) since food is completely non-toxic. You can make a huge batch each time since it doesn’t need refrigeration and it will keep indefinitely without any special storage conditions. Survival101 I did a google search and found the recipe at this link, below. If one would be interested, they could go to this link ~ http://pinterest.com/search/pins/?q=master+tonic and find dozens more, probably all saying pretty much the same thing...tho', which is often a good idea. That way you can compare and most likely not miss anything important. Survival101 thanks for posting the link for the Master Tonic Recipe! That looks like it would work! I used to buy kim chi and this looks like it might taste similar. A good immune boost, likely! The best apple cider vinegars are organic, unfiltered and raw (unpasteurized). I personally use scraps (peels and cores). This way I get to eat my apples and make vinegar too. 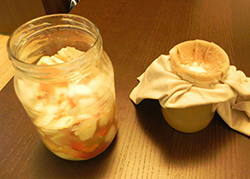 Or if you are making a pie or apple sauce… instead of throwing away the scraps, you can start making your first vinegar. Peel the apples and fill your container by at least half way with your apple scraps (peels & cores), seed, stems and all. If at least half the container is not filled, add additional apple scraps until you achieve this level as a minimum. Make sure the pieces are big enough to strain out easily later (no puree). 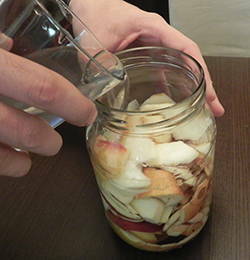 Pour in room temperature (filtered) water until the chopped apples are completely covered and the container is just about full leaving 1-2 inches at the top. Stir in the raw honey or cane sugar until fully dissolved. Optional: you may add yeast to speed up the process of fermentation (Special cultivated yeasts are available for this purpose at wine-making shops). 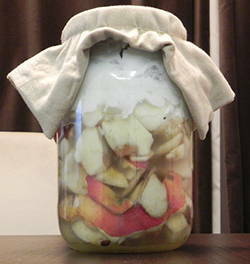 Tip: You could use raw apple cider vinegar to jump start this fermentation, use 2 Tablespoons per quart. Stir the mixtures daily. Keep the containers away from direct sunlight and maintain the temperature at 60 to 80 degrees F.
The healthy bacteria that create vinegar require oxygen for the process, so it is important not to seal the container with a lid until the vinegar is as strong as you want it to be. Leave on the counter for about 1 week. Bubbles will begin to form as the sugar ferments into alcohol. 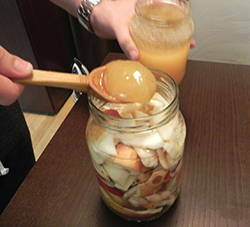 When the apple scraps no longer float and sink to the bottom of the jar (see picture) after approximately one week (but it can take 2), the hard apple cider is ready. 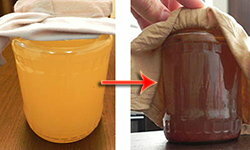 Strain out the apple scraps and pour the hard apple cider into another glass jar. Cover with a fresh piece of cheesecloth and secure with a rubber band. Leave on the counter in an out of the way spot for an additional 3-4 weeks to allow the alcohol to transform into acetic acid by the action of acetic acid bacteria. Floating in your vinegar you’ll find “Mother of vinegar” – a substance composed of a form of cellulose and acetic acid bacteria that develops on fermenting alcoholic liquids, which turns alcohol into acetic acid. This is normal! Filter the liquid through several layers of fine cheesecloth or filter paper—a coffee filter works well for this. This removes the mother of vinegar, preventing further fermentation or spoilage of the product. If the vinegar highly acidic and you find it almost too potent you can simply add some spring or filtered water to mellow the acidity. Raw apple cider vinegar doesn’t go bad, but if you leave it for a long time, another mother culture will likely form on top. This is fine, just strain it again and dilute with a bit of water if the taste has become too strong. If you want to prevent this from happening, you have to pasteurize the raw vinegar. To pasteurize you vinegar, pour the vinegar into a large stainless steel or enamel coated pot. Over medium heat bring the vinegar up to 140 F degrees and hold it at this temperature for 10 minutes. Be careful not to boil your vinegar. Turn off the heat and allow the vinegar to cool, uncovered. Once it’s cooled, pour the vinegar into your storage container and seal until ready to use. Two factors require special attention when making vinegar at home: oxygen supply and temperature. Oxygen is spread throughout the mixture by stirring it daily and by letting air reach the fluid through a cheesecloth filter, which is used in place of a regular lid. The temperature of fermenting cider should be kept between 60- and 80-degrees Fahrenheit (F). 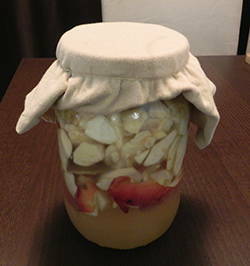 Lower temperatures do not always produce a usable vinegar, and higher ones interfere with the formation of the “mother of vinegar”. Do not use a metal container when making vinegar; acid in the mixture will corrode metal or aluminum objects. Glass, plastic, wood, enamel, or stainless-steel containers should be used for making or storing vinegar. Wow! Just wonderful, and I love the images.